Every one must have seen the statue of "Laughing Buddha".He is also called as the "Happy Man"
In actuality he was named Hotei or Pu-Tai is best known as the jolly Laughing Buddha.In China, he is known as the Loving or Friendly One.He is based on an eccentric Chinese Ch'an (Zen) monk who lived over 1,000 years ago and has become a significant part of Buddhist and Shinto culture.Because of this monk's benevolent nature, he came to be regarded as an incarnation of the bodhisattva who will be Maitreya (the Future Buddha). 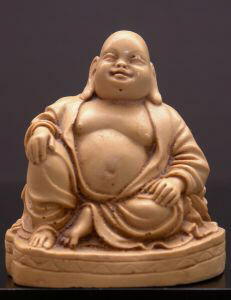 His large protruding stomach and jolly smile have given him the common designation "Laughing Buddha." He was truly a great zen master and legend has a great story which is so inspirational for all of us. The jolly good saint that he was used to go from one place to the other.He went to the Town Square and soon people gathered around him. He was so funny looking and always smiling that people used to crowd around him. He would then distribute sweets and small toys to all children who had gathered around him. Then keep his bag down, look to the sky and just start laughing. He used to laugh madly and he was not interested whether other laughed or not. Soon his laughter used to be contagious and all who had gathered would start to laugh. The whole town used to laugh and laugh.After sometime he would pick the bag, which he had kept down, smile to all, and go to the next town. All his life he did only this action and it was said that many people attained Nirvana, enlightenment just through this process.Hence he was called as the laughing Buddha because Buddha is someone who is enlightened and laughter was his unique method. Never before him or never after him such a simple aspect was used to achieve what all humans strive for-moksha or enlightenment. He would rarely speak and once when he was asked to describe his method he told, that he gave sweets to children to symbolically that the more you give, the more comes to you. Thereby he unveiled the secret of "Giving with joy". Children are said to be GOD because they represent the GOD Nature, which is always, be in Present time, smiling and joyful, ego less, and most important is without judge mental mind. The bag represented problems that all humans encounter. We are mistaken that when we have problems, that GOD only gave you a problem and the rest are so happy. The problems appear big because we are associated with it- calling it as "My Problem".Look at a funny phenomenon, if anyone comes to you with any problem of theirs and seek solutions or advice, what you do. You tell them so many solutions so easily as though you are an expert in all the fields in the Universe. However big the others problems are you can solve it so easily, you are a master solver of problems. But then what happens to your own problems. Hmm Hmm it is impossible to find any solution. This happens only because of your attachment and association with the problem.So laughing Buddha said, simple keep your problem down (symbolically keeping the bag down) means "Disassociate with your Problem", "Separate form it" and yes just Laugh. What else can one do? Think and thank GOD that you only have such a small problem as compared to so many others. Whether you laugh or cry the problem is going to be there right. So why not laugh at it. Therein is the magic and mind you no small magic, it is huge, apply it to realize about the power of laughter. On laughing your whole internal chemistry changes and thereby the body produces certain enzymes that are only released in a state of laughter. The problem now looks too tiny and as you pick it (symbolically he picks back the bag before going to the next place) the problem is solved. Such a great zen master was Hotei or Laughing Buddha. So next time you look at the statue of "laughing Buddha" associate with that great teaching he gave all of us, the power of laughter. Each time you see the Laughing Buddha and if it reminds you to laugh, a great work has been done. Whole life Hotei lived in Laughter. And when the time came to pass away, he knew he had to give up his life at an appropriate time. He called his disciples and said that after he passes away, they should immediately burn his body. The disciples were surprised because there was no tradition of burning in Zen. But they followed the master wishes. And as they lit fire to his body, "Fire Works and Crackers" started flying all over. Hotei was so great that just before he died he hid a lot of crackers and rockets in his clothes.So there also he created such laughter by the suddenness of the situation.So Hotei not only lived in laughter all through his life, he also died in laughter. Let us all learn from the great zen master that "It is our birth right to laugh" and "No matter what happens we should come back to laughter".